Catapult returned to Carsington on June 4th-5th, for the onset of summer in (eventually) bright sunshine, with a warm welcome from the Club. 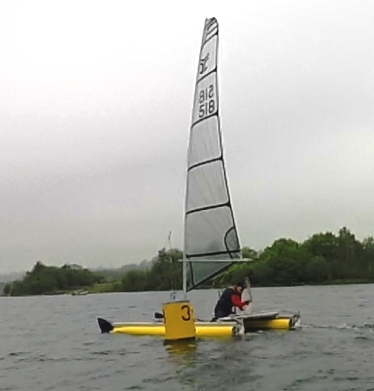 We joined the club Cruiser racing on Saturday, and on Sunday had a separate start with the Club dinghies. Both days had the same light northerlies, shifting and fluctuating but with usually enough breeze for good if taxing racing. Stuart Ede showed mastery of the light conditions (showing that light-weather racing only feels like luck) working to the front in each race and scoring four firsts. On Saturday, the RO set a short port-rounding rectangle, with a longer beat and a dead run, running three back-to-back races. Tactics in the shifting breeze centred on deciding whether to tack on wind-shifts, with big gains or losses from guessing wrong. 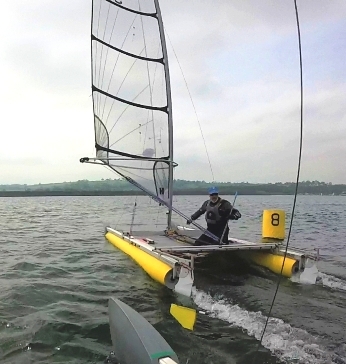 For Race one the wind abruptly died before the start, so the Catapult fleet straggled slowly to the line, with Stuart Ede best placed, who stretched away. Gareth Ede slowly chased Stuart, catching him on the long beat and moving away. On the next beat Alastair Forrest pulled out from Syd Gage and Justin Evans behind, but then watched as they pulled up on the third beat, finally not able to take the third place away. In Race 2 from a tight start on starboard end, the fleet stayed close splitting left and right with Gareth moving ahead. Alastair defended second against Stuart round the two laps, but Stuart came up on the long run, and Alastair's mark touching set him free, with Justin Evans catching Alastair but then not being able to defend this in the final beat. At the Race three start, with a new course after the wind shifted west, Alastair picked that the next mark could be laid on starboard without tacking, and the port end of the line was closer to the next mark, to get a lead, but Stuart to windward came through fast. These two battled out in front, but Gareth came through on the next beat with Alastair chasing him hard. Right: event winner Stuart prepares to swing onto the beat, Race 3, ahead of Syd Gage (camera). Sunday kept the same northerly breeze but with the cloud breaking to give bright sunshine. The breeze dropped at times and vacillated but most gave sufficient racing speed. The RO set a mixture of triangular and dog-leg courses, juggling the marks as the breeze shifted. In Race four Stuart and Alastair picked the port end advantage, and with Gareth coming up fast, these three battled round the course in gentle breeze. On the lap two beat, Alastair picked that breeze was channelling down the valley to the right of the top mark, and tacking up this channel gained a huge lead, needing only to run and reach to the finish. He ignored the principle of keeping between the mark and the chasing boats, going out right on the run chasing breeze to land himself in a hole, and watch Stewart and then Gareth coming relentlessly through. These three kept close, but were unable to force any more place changes. For Race five with the wind still light and shifting, Alastair won the start at the starboard end, and the fleet tacked slowly away, only to look back and see Stuart (who had disastrously stalled before the start) pick up a lifting fresher breeze on the left, and race to round the top mark. The mark turned out to be a gate in the falling breeze, and by the time the fleet inched up to it, Stuart was half a mile ahead. The chasing boats crept down the dog-legs, with Alastair caught by Gareth and then Justin, and in the final tacking to the line Syd came storming in bringing up breeze to take third behind Justin's third. Race six after lunch had steadier breeze, and Alistair followed by Stuart and Gareth won the starboard-end start and they lifted to a good lead staying close. On the second (and final beat) Gareth and Stuart went left, Gareth carrying well out, then catching the breeze first and moving to a comfortable first with Stuart behind. The Ede family shared the top two places in almost every race, and Gareth tightened his firm grip at the top of the Leaderboard, now being able to count first places throughout.